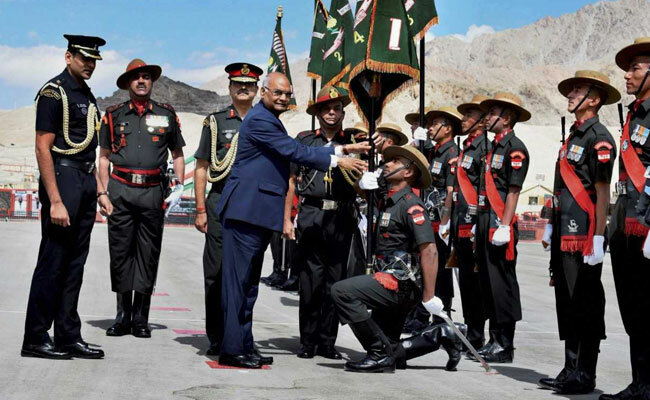 The President, who is also the supreme commander of the Indian Armed Forces, drove straight to the Ladakh Scouts Regimental Centre where he will take the salute at a parade and present the President's colours to the regiment and its five battalions. Leh: President Ram Nath Kovind today arrived in Leh on a day's visit to Jammu and Kashmir. This is his first visit outside Delhi after assuming office earlier this month. Jammu and Kashmir Governor NN Vohra, Chief Minister Mehbooba Mufti, senior ministers, Indian Army chief General Bipin Rawat and other civil and military officials received Kovind at the Leh airport. General Rawat had on Sunday arrived in Leh on a two-day visit to take stock of the situation on the Line of Actual Control (LAC) between China and India. A recent video showed soldiers of the Indian and Chinese armies hurled stones at each other in Ladakh. Row Over Veterans' Letter To President On Forces Being Used For "Agendas"